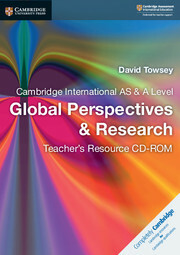 Helping you clarify and teach the Critical Path, this CD-ROM is the only endorsed teacher’s resource for the syllabus. 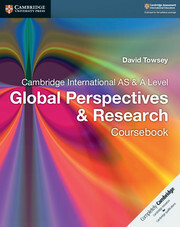 With suggested answers to the coursebook questions, lesson plans, sample schemes of work and worksheets, the Cambridge International AS & A Level Global Perspectives & Research Teacher’s Resource helps you deliver this skills-based course. Whether you’re teaching the full A Level, the AICE Diploma or the Pre-U, this resource has tools to make your life easier. Learning objective checklists provide scaffolding for student reflection and peer assessment. Sample lesson plans help you get the most out of the coursebook and give you confidence to teach a course without ‘content’. Printable worksheets save you time and help keep students focused on activity requirements. Two sample schemes of work – staged delivery and linear delivery – help you plan your lessons by skillset. Guidance at the end of the resource supports your use of the coursebook with the Pre-U Global Perspectives & Research course.